The London 2012 Olympic Games are destined to be remembered for a lot of things including - hopefully - the heroics of British athletes like Jessica Ennis and newly crowned Tour de France winner Bradley Wiggins as they compete for gold. But the chances are London 2012 will also be remembered as the first musical Olympics, when spectators walk away from the velodrome or aquatics centre whistling a classic or humming one of the five official Olympic songs from Muse, Elton vs Pnau, Dizzee Rascal featuring Pepper, Delphic or Chemical Brothers. This is because for the first time in the Games history - this is the 30th summer Olympics - there is a real partnership between the Games and the music industry. In effect this is LOCOG and Universal Music, which has the role of the official music licensee. In addition to the opening and closing ceremonies there will be high profile performances by bands and singers throughout the next few weeks with music also being played during breaks in play and occasionally when sport is taking place. Robinson adds the series of live concerts will not simply be straightforward performances, but will be accompanied by a “very strong creative”. Locog's head of sport presentation and music James O'Brien has compiled a massive playlist of over 2000 songs, which will appeal to the thousands of spectators from all over the world and will be played throughout the stadiums and different venues over the Olympic period. These 2000-plus songs have been placed into a series of five themes to provide the most appropriate sound platform for everything from archery to BMX biking. Thus, more genteel sports such as tennis will be soundtracked by classical music and well known songs by established acts. This is the Heritage strand. Sports such as gymnastics and swimming, which traditionally attract family audiences, will be accompanied by music from the kind of mainstream acts that crop up on big TV shows like the X Factor or The Voice. This is the Prime Time theme. The Extreme strand will feature more dance-orientated music to score events such as canoeing and BMX. Urban music will be the cheerleader for sports such as basketball and cycling. The remaining 300-plus songs on the playlist will be tagged World Stage and these will big stadium rockers used to promote blue ribbon track and field events within the stadium at Stratford. “Depending on the different sport, different music will be selected to be played in the stadium and venues at that time,” explains Robinson. 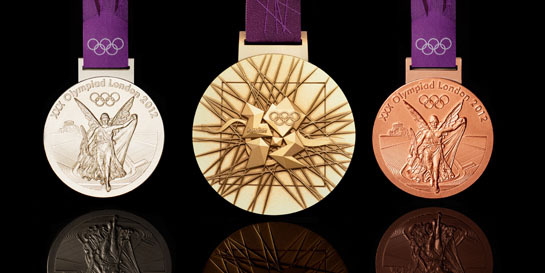 This is alongside the five official songs selected to represent the five different themes throughout the many medal presentations and opening and closing of different events. Chemical Brothers have scored a special Olympic track called Velodrome to be used during the cycling events while Muse were charged with writing the rousing Survival to salute athletes entering the stadium with a further three songs lined up from Elton John v Pnau, Delphic and Dizzee Rascal featuring Pepper. But, as to which song will dominate this year’s Olympics like Usain Bolt or Victoria Pendleton, Robinson is willing to leave the market to decide. “Obviously with sport it is such an emotive thing. The public will decide which one (song) prevails and is the gold medal of all the music,” he says.